Note that these events are not connected with ACMS and the details may have changed, please confirm the details with the event organiser before travelling. Surrey History Trust - talk by Mark Samuels Lasner. Saturday 8 June 2019, 2:00pm - 3:30pm at the Surrey History Centre, 130 Goldsworth Road, Woking, GU21 6ND. Mark Samuels Lasner, collector, bibliographer and typographer, is Senior Research Fellow at the University of Delaware Library. His many publications include The Bookplates of Aubrey Beardsley (2008) and England in the 1890s: Literary Publishing at the Bodley Head (1990). He has curated exhibitions at Harvard University, the Grolier Club, and the Rosenbach of the Free Library of Philadelphia. In 2003 he was awarded the Sir Thomas More medal from the University of San Francisco, for his achievement in making private book collecting a public benefit. In 2017 the University of Delaware Library celebrated his gift of over 9,500 works of Victorian literature and art with a symposium and exhibition, Victorian Passions: Stories from the Mark Samuels Lasner Collection. In this talk Mark will share his passion for collecting Victorian books and highlight some fascinating Surrey connections. Initiated by Watts Gallery – Artists’ Village and funded by the Tavalozza Foundation and the Heritage Lottery Fund, The Artist’s Studio Museum Network aims to raise the profile of artist’s studio museums and their collections. 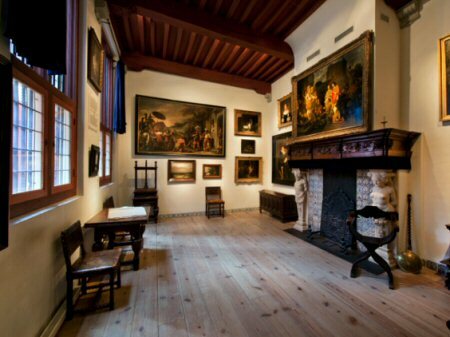 There are currently over 100 museums included, representing 20 European countries. There is a particularly strong representation from Arts and Crafts interiors, with participating museums including: Leighton House, London, home of the great Victorian academic painter Frederic, Lord Leighton (1830-1896) and site of the famous ‘Arab Hall’. Limnerslease, at Watts Gallery – Artists’ Village, where Leighton’s friend GF Watts worked during the winter months; three sites associated with writer and designer William Morris (1834-1896) and the Victorian family home that became a studio for Morris’s friend Emery Walker (1851-1933). 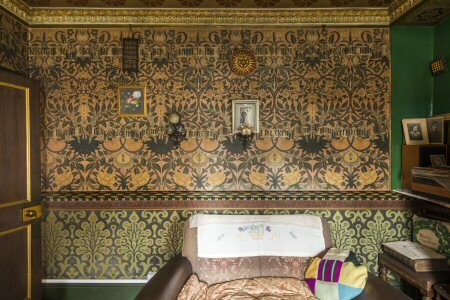 More unusual is David Parr House, Cambridge, an unassuming terrace where Parr – an ‘artist painter’ employed by day at the decorative firm F R Leach - created his own luxury arts and crafts interiors, including hand-painted wall decorations, Gothic carvings and stained glass. These UK arts and crafts house-museums now join an international network of artists’ studios, many with similarly spectacular interiors, as at Millesgården, Lidingö - where the Swedish sculptor Carl Milles (1875-1955) established a studio and sculpture garden - and the Rembrandt House, Amsterdam, whose purchase in 1639 would eventually drive Rembrandt van Rijn (1606-1669) into debt.